Whew. It has been a flurry of activity on my novel front. Revising/editing has consumed me, and the work is showing it. I have revised/edited four chapters in the last two days. This is a long process, but the outcome is well worth it. I am seeing characters find their voices and scenes gaining levels. When I see how much I change from drafting to revising, it astounds me. The blood bath the pages go through is something of a birth by fire. One chapter lost over a thousand words, but gained two new levels of meaning and a nice foreshadowing I hadn’t even planned. 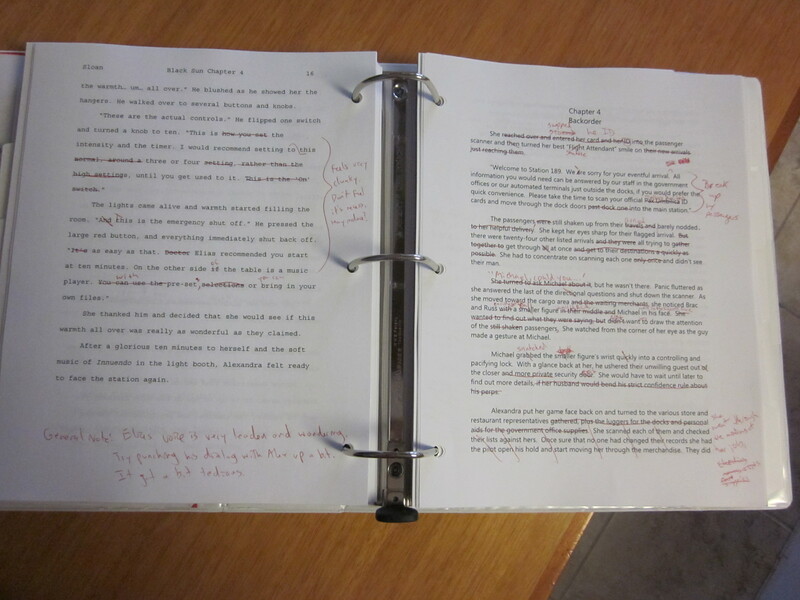 Each writer has their own process for revising/editing. Mine is still growing as I learn, but so far it has many stages. 1) I print out the chapter or chapters I plan on working on. Printing them out lets me see more than the computer screen does. I take my trusty red pen (it’s not just for students anymore) and go to work. I look for the biggest things. Attacking it as a writer. Last time I was at this spot, it was not a completed work. I may have had a plan, but the ending probably wandered down a different course at some point. Characters did not end up how I had thought. So now I need to match character voice, goals, emotions as well as story and tone with what will finally happen. 2) Next read I look for continuity. I have made changes, time to see if they all line up with the finished product. Since I am doing paranormal and sci-fi, do I follow all rules for race, technology, world, station and magic that I established? Continuity errors are my pet peeve, so this is a big step for me. 3) Now it’s time for the dreaded grammar check. No, not the one on the computer. I can’t tell you the amount of times I have yelled at the computer “You are wrong” over its grammar “suggestions”. I look for my own personal patterns of errors. Questions marks are my nemesis. Run-ons challenge everyone. Have I backloaded the right sentences? Everyone has their personal quirks, I just concentrate on mine. 4) Filler words. CTRL-F is my friend here. I look for all those words that make writing weaker. Those dratted words that fill space not meaning. Searching for overusing “that”, “really” (and most other adverbs, thank you, Steven King). Sensory words that break the story flow are something else to go “thought,” “felt,” “sensed,” etc. By using the find function, I can shorten my time in this area and ensure I don’t miss any. A small cheat, but it works. 5) Time for my secret weapon: my husband. I get to have the advantage of him as my first reader and editor. He will take my work and mark it up with any suggestions or errors he find. (Don’t worry; I do the same for him). The most important part here is we are honest with each other and don’t get upset at each other for suggestions. But he gives me those first pair of fresh eyes to see what my creating eyes can’t. Useful beyond words. After, I decide what suggestions to take and finish that chapter with a clean copy. Then I move to the next chapter, repeating the entire process. So far, this method has cleaned up my work to a decent point. Once I finish the entire work, I will do it once more from beginning to end, just an overall read. Making sure all the changes work, and I don’t see anything new. Then it’s time for Beta Readers. Speaking of which, thank you to S.B. for agreeing to be one of my Beta Readers when the time comes. That point, however, is a month or so off. So that’s my process at the moment. I’m doing some of it every day, getting through it slowly but surely. When I get frustrated with the process and the time it takes, I simply remember, “When something can be read without effort, great effort has gone into its writing.” ~Enrique Jardiel Poncela. This entry was posted on Friday, May 13th, 2011 at 6:29 pm	and tagged with Editing, Revising, Update and posted in Black Sun, Writing Process. You can follow any responses to this entry through the RSS 2.0 feed. What hard work goes into not just creating a world in your Book,but to put it together in a way that keeps the reader facinated. Can’t wait to read the first chapter. Ich bin so stolz auf Dich!